Bridget Dunlap, the Queen of Rainey Street, is breaking new ground with her first restaurant venture on Austin’s East Side. Known for being the force behind downtown’s Rainy Street district, Dunlap once again puts her instinctive creativity and vision to work. Mettle harmonizes modern architecture with a relaxed feel, and serves food that’s worth talking about: French bistro backed by Executive chef Andrew Francisco. Housed in a former tortilla factory, Mettle is located where E. 6th St. ends, at 507 Calles Street, a destination in itself. Executive chef Andrew Francisco has an array of impressive experience (he interned at The French Laundry), and prior to launching Mettle was chef de cuisine at Austin’s Olivia. The menu combines traditional bistro with international influences that reveal Francisco’s daring to mess with tradition in the name of fun. For example, the everday menu features salmon crudo with thai chili, purple oxalis, vanilla, pretzel ($15); and spaghetti with braised pork, poached egg, duck, star anise ($21). The desserts follow suit such as brioche ice cream with tonka bean and dulce de leche ($5). His ingenuity extends to brunch as well, with a menu featuring pancakes with smoked butter, pork belly, jalapeño, and sassafras syrup; mushroom omelet with mozzarella, arugula, and garlic-clove tempura; fried bread with goat butter, jam, and powdered bacon fat; and grapefruit brûlée with juniper sugar and sea salt. Aside from what’s simply interesting, Francisco is also using locally-sourced ingredients, including the herbs he grows on site. The L-shaped 4,000 sq ft restaurant seats nearly 200 guests in a variety of dining areas, and the bar that features a floor-to-ceiling sculpture (by Ion Art) in the center of the room. The décor is a mix of modern and decorative: European wallpapers; an original painting by artist Ian Schults; a glass sculpture by artist Leigh Wyatt hangs from the ceiling; and metal clad walls curve through the space. A comfortable banquette makes a stylish divider—and connection—between the bar and main dining area. There’s a good feeling with Dunlap’s stylish vision. Like Dunlap’s Lustre Pearl, Clive Bar, and Bar 96 concepts, Mettle pours freshly squeezed juices, Prohibition-era drinks and seasonal cocktails such as the siamese caipirinha with thai chili and basil infused cachaca, lime; the mexican 86 with gran centenario reposado, grapefruit, rose champagne; or the wimbledon cooler with pimm’s no. 1, cucumber, lemon and ginger ale, to name a few. All cocktails are $10. The restaurant also offers one of the most extensive wine selections on the East Side, with some eighty labels and by-the-glass options in addition to curated recommendations for food pairings. The community tables, which seat as many as twenty guests, encourage mixing and socializing, while the adjoining dining room provides a more intimate experience. There’s a patio lined with plants that make in a space in itself, great for relaxing and socializing with handcrafted cocktails, or a great glass of wine. 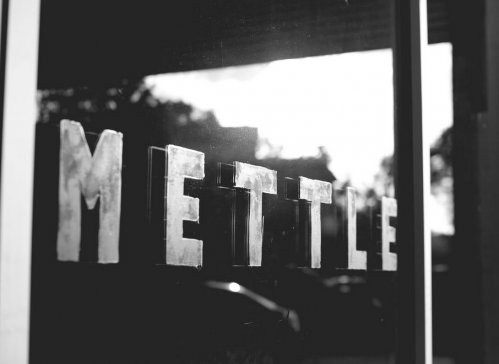 Mettle is located at 507 Calles, in East Austin. Hours are Tue­­sday through Thursday from 11 a.m. to 10 p.m.; Friday and Saturday from 11 a.m. to 11 p.m.; and Sunday 11 a.m. to 9 p.m. For more information about Mettle, call 512.236.1022 or visit mettleaustin.com.